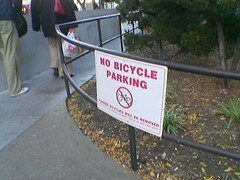 It would appear that bikes are no longer welcome along the railing at Foggy Bottom-GWU Metro. FYI, you passed James and I at the Foggy Bottom metro stop. You looked to be in zombie mode. Russell – Yeah, I was thinking “I can wait one minute for a less crowded orange line train” just when I saw you behind closed doors. That left me wondering all night if I had walked right by you.